Erin and I took a field trip to Geppi’s Entertainment Museum and lemme tell ya, my mind was officially blown. Anyone who has the displeasure of knowing me personally knows how much I love classic cartoons and comics, in fact, I love them more than I love Erin, my parents and God combined. It’s hard for me to imagine mainstream America being interested in a museum like this, after all, I can’t imagine justifying a school field trip here, what with the uncomfortable questions that would arise, such as what’s a golliwog, or, what is a comic book, but I sure am glad Stephen A. Geppi, President and Chief Executive Officer keeps the lights on, mostly out of his own pocketbook. Speaking of which, from what I understand, this museum is made up of Geppi’s personal collection, which, of course, makes him the luckiest man in the world. I really appreciated the cohesive layout of the exhibits. You pretty much walk through the history of pop culture. I mean, I guess. 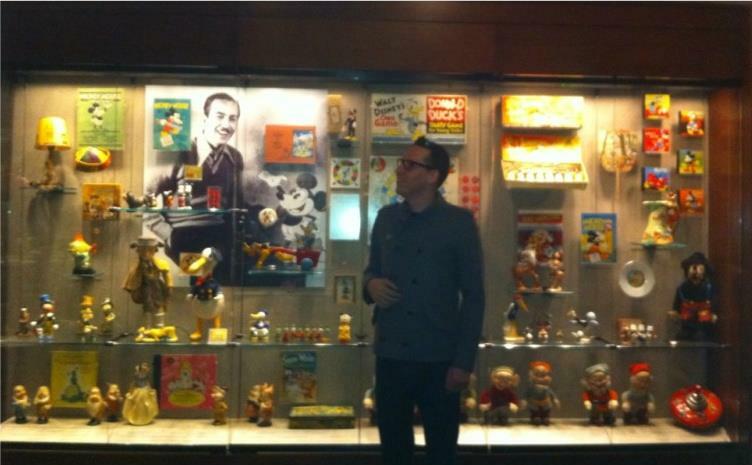 I was most pulled in by the pre WWII Disney Memorabilia which was in pristine condition. Who kept this stuff? How did it hold up? Who knew it’d wind up in a museum? At any rate, every nook and cranny was filled with something interesting. Particularly the crannies. It’s kinda hard to even take in all in. It kinda makes me wonder why they waste such a large portion of the museum on the ‘expanding universe.’ This is the section that shows us such gems as the first issue of Spawn and the first issue of Youngblood. Uh, Stephen A. Geppi? We don’t need to go to a museum to see this stuff. We can find these ‘modern classics’ in dollar bins and yard sales across this great nation of ours. In fact, this is the kinda thing that killed the industry. Oh well, at the end of the day, you still are a comic book mogul and those sillybooks probably built that very wing. Oh, I can’t leave you on such a neggy note. Erin and I totally loved the museum and would recommend it to anyone with an IQ above 26. I can’t say enough about it, thankfully, I don’t have to. As they say, a jpeg is worth a thousand words, and I got oodles of them. You know the drill, click to see them all big and junk. This entry was posted in animation, comics, Disney, reviews, Warner Bros. and tagged animation, comics, Disney, Donald Duck, Erin, reviews on January 4, 2012 by Josh Latta.